In the days where the lyricism of rap and the special talent of it all seems to be secondary to the fist-pumping action that occurs in the music, it could be easy to discredit rap and hip hop as a genre on the decline. However, a quick search on the internet would quickly show a whole underground culture that is stronger than ever before. Sometimes it means dwelling into local acts who are quietly preparing for their rise as lyrical masters with a flow as smooth as silk. C. Shreve the Professor, a man we've been keeping tabs on for quite a while now, is one of these said lyrical masters. The leader of FTO (Free the Optimus), the collective has been bringing intelligent, socially conscious rap into the forefront in North Carolina for a while now. 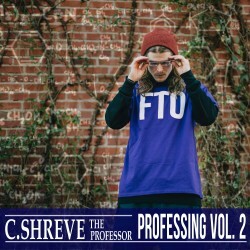 C. Shreve has recently put out Professing Vol. 2, and the first single to come off the album is "It's All Live," which features Phlo Deli, another EARMILK favorite. The two go great together in this track. In film they say that fun sets bring out terrible movies, but it's very much not the case here. The track is a great culmination of their talents, and musical evidence that working hard and playing hard are equally important. Professing Vol. 2 is out now via Bandcamp. C. Shreve is holding the "Summer Ransom"